Dyson vacuums V6, V7 and V8 share same design philosophy, but they also differ in many important details, including operating time, suction power, size, available cleaning attachments etc. Dyson V6, V7 and V8 are convertible cordless vacuums, powered by power fade-free lithium ion batteries, with great suction and with many cleaning attachments for various tasks. As lightweight upright vacuums, thanks to the lithium ion batteries, advanced cleaning heads and other cleaning tools, Dyson V6, V7 and V8 cordless vacuums can be used as the main vacuum cleaner at smaller homes and apartments. For such role, some people still prefer corded upright vacuums, which offer stronger suction and longer operating time, without limitations of onboard batteries. 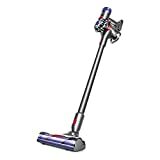 For more about Dyson upright vacuums check Dyson Small Ball, Ball and Cinetic Big Ball Upright Vacuums – Comparisons and Reviews article (link opens in the new window). – Dyson V8: dirt bin volume 0.5 liters, suction power 115 Air Watts (burst mode), operating time 40 minutes (normal mode). 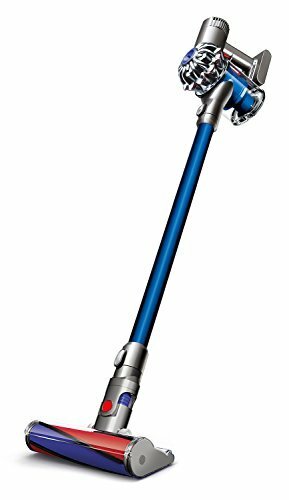 Dyson V6 Handheld Cordless Vacuum Cleaner comes in several versions, with Dyson V6 Cordless Vacuum model replacing old Dyson DC35 vacuum and Dyson V6 Motor Head Cordless Vacuum model replacing Dyson DC44 vacuum cleaner. Dyson V6 vacuum cleaner is (or was) available in 10 or so models, which differ in available cleaning tools, level of air filtration, intended purpose and of course, the price. Note that, at the moment, not all Dyson V6 models are offered on official Dyson’s website. List of ‘old’ and ‘new’ Dyson V6 models include: Dyson V6 Trigger, Dyson V6 Mattress, Dyson V6 Car + Boat, Dyson V6 Top Dog, Dyson V6 Cord Free Vacuum, Dyson V6 Baby + Child, Dyson V6 HEPA, Dyson V6 Motorhead, Dyson V6 Animal, Dyson V6 Fluffy, and of course, Dyson V6 Absolute. 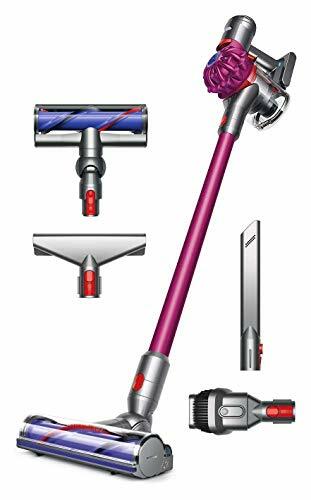 Dyson V7 cordless vacuum cleaner can be used as handheld cordless vacuum cleaner or as stick/upright vacuum cleaner. It comes with improved lithium-ion battery, which provide fade-free power up to the 30 minutes and in maximum power mode, up to the 6 minutes. 30 minutes is generally more than enough to cover rather large area and thoroughly clean it. Unit is lightweight and easily carried around, even by elderly people. It is stored and charged in docking station, waiting to be used at the moment notice. Dirt bin capacity is 0.5 liters and it is enough for most tasks. Since dirt bin is easily emptied, it is recommended to empty the dirt bin after each use. Dirt bin is transparent, enabling the user to monitor type and amount of vacuumed dirt (missing socks anyone?). Like Dyson V6 and V8, air filtration is based on strong cyclonic action and mechanical filtration. At the moment, Dyson V7 cordless vacuum is available in several models: Motorhead, Absolute, Animal HEPA, Trigger and Car+Boat. – this model includes: Dyson V7 Motorhead, Direct-Drive Cleaner Head, Docking Station, Combination Tool and Crevice Tool. Check Price– this model includes: Dyson V7 Absolute, Soft Roller Cleaner Head, Direct Drive Cleaner Head, Mini Motorized Tool, Docking Station, Combination Tool, Crevice Tool and Soft Dusting Brush. 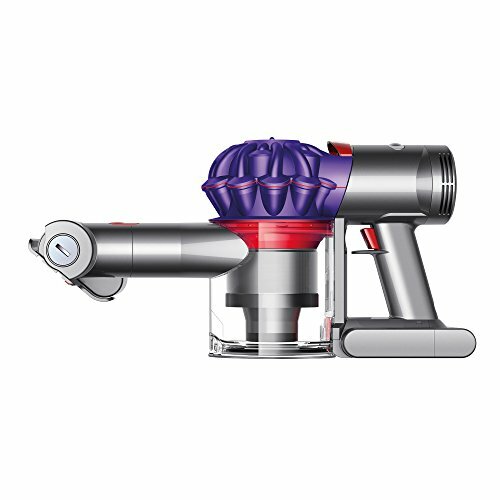 Model on the left – Dyson V7 Motorhead with Direct-Drive Cleaner Head. Model on the right – Dyson V7 Absolute with Soft Roller Cleaner Head mounted on the wand. – this model includes: Dyson V7 Animal HEPA, Direct-Drive Cleaner Head, Docking Station, Quick Release Combination Tool, Quick Release Crevice Tool, Quick Release Mini Motorized Tool, Quick Release Mini Soft Dusting Brush, Quick Release Stubborn Dirt Brush, Hard Floor Tool and Dyson tool bag. – this model includes: Dyson V7 Trigger, Mini Motorized Tool, Combination Tool, and Crevice Tool. Check Price– this model includes: Dyson V7 Car+Boat, Car Charger, Mini Motorized Tool, Extension Hose, and Combination Tool. Model on the left – Dyson V7 Animal HEPA with Direct-Drive Cleaner Head. Model on the right-top, Dyson V7 Trigger and model on the right-bottom, Dyson V7 Car+Boat. More on cleaning heads and other attachment – later in the article. As said before, Dyson V8 cordless vacuum cleaner follows the same design philosophy just like Dyson V6. It can be used as handheld cordless vacuum cleaner or as cordless stick/upright vacuum cleaner. It comes with high capacity lithium-ion battery, being able to provide fade-free power up to the 40 minutes and in maximum power mode, up to the 7 minutes. Unit is heavier than Dyson V6 or Dyson V7, but still very lightweight and easily carried around. It is also stored and charged in docking station, waiting to be used at the moment notice. Dirt bin capacity is 0.5 liters and it is enough for most tasks at home. Considering the price, features and 40 minutes of operation on a single charge, dirt bin could be larger. Dyson V8’s dirt bin is also transparent and easily emptied. At the moment, Dyson V8 cordless vacuum is available in two models: Animal and Absolute. – this model includes: Dyson V8 Animal, Direct Drive Cleaner Head, Mini Motorized Tool, Combination Tool, Crevice Tool and Mini Soft Dusting Brush. – this model includes: Dyson V8 Absolute, Soft Roller Cleaner Head, Direct Drive Cleaner Head, Mini Motorized Tool, Combination Tool, Crevice Tool and Soft Dusting Brush. Model on the left – Dyson V8 Animal with Direct-Drive Cleaner Head. Model on the right – Dyson V8 Absolute with Soft Roller Cleaner Head mounted on the wand. More on cleaning heads and other attachment – later in the article. Dyson V8 offers excellent operating time, double of the Dyson V6 and 33% better than Dyson V7. It also comes with large number of cleaning attachments for various tasks and surfaces. Note that it is also possible to order other Dyson’s attachments later, if required. Although it has the best lithium ion battery so far, Dyson V8 still has rather short operating time on maximum power – just 7 minutes. However, during those 7 minutes, its suction is almost as the suction of large corded units. Just like Dyson V6 Cordless, both Dyson V7 and V8 vacuums can be used as lightweight cordless stick/upright vacuum cleaners, or due to dimensions and light weight, as handheld vacuum cleaners. By removing extension tube/wand (in few seconds) they convert from uprights into handheld cordless vacuum cleaners. Thanks to their suction and available tools, all these vacuums can be used for cleaning of various surfaces, as emergency vacuums at home and apartments, or they can be used even as main vacuums in smaller homes, apartments, dorm rooms etc. for cleaning from the floor to the ceiling. From left to right: Dyson V6 Absolute with Soft Roller Cleaner Head, Dyson V7 Absolute with Soft Roller Cleaner Head and Dyson V8 with Direct-Drive Cleaner Head. Note: these units are powerful and not-so-cheap vacuums, so if you plan to teach your children how to, for example, keep their room clean, IMHO, get cheaper cordless vacuum. Anyway, what you pay is what you get and if you need high-performance cordless vacuums, consider one of these units. Note: At the moment, Dyson V7 Absolute is available only via Dyson’s official webiste. All Amazon links in the table open in the new windows, so feel free to check them. Dyson V6 Cord Free Vacuum (mentioned in the table for comparison) has Motorized Cleaner Head, while Dyson V6 Absolute, V7 Absolute and V8 Absolute have Direct Drive Cleaner Head, with V6 Absolute and V7 Absolute having 75% and V8 Absolute having 150% more brush bar power. When combined with stronger suction (115 vs 100 Air Watts), Dyson V8 Absolute cleans better than V6 or V7. As one can see in the table, Dyson V8 is slightly heavier than V6 and V7, but it has larger dirt bin than V6, stronger motor, more durable battery and it cleans better. Dyson V7 sits right in the middle with its performances, weight and price, often having certain features just like V6 and some like V8. Dyson Absolute V6 and V8 are true HEPA vacuum cleaners with excellent air filtration – very important for people with issues like asthma and allergies. Dyson V7 Absolute does not come with Post Motor Filter and it is not true HEPA vacuum, but nonetheless, its air filtration is still very good. They also come with practically same additional cleaning tools, that help them to clean various dry surfaces and to clean hard to reach areas and tight spaces, corners and stairs. Being powered by fade-free lithium battery, maximum operating time of V8 Absolute is up to 40 minutes, using attachments like crevice tool or dusting brush. If powered cleaning attachments are used, then operating time is decreased – up to 30 minutes with the Soft Roller Cleaner Head, and up to 25 minutes with the Direct Drive Cleaner Head. Dyson V7 Absolute operating time is up to 30 minutes in normal operating mode using cleaning tools like crevice tool or brush tool. When using cleaning attachments like Soft Roller Clean Head or Direct Drive Cleaner Head, operating time is decreased. In the burst mode (maximum power mode), operating time is up to 6 minutes. Other main Dyson V7 and V8 improvements are reduced noise levels, up to 50% compared with V6, and improved hygienic dirt ejector. Most important cleaning attachments are Direct Drive and Soft Roller cleaner heads and they are used mostly for floors. Direct Drive Cleaner Head uses built-in motor inside brush bar. Stiff nylon bristles help in removing dirt and pet hair from carpets and rugs. Soft Roller Cleaner Head is optimized for cleaning both dust and large debris from hard floors – soft nylon bristles pick large debris, while carbon fiber filaments remove fine dust and dirt. Combination Tool combines two tools in one: debris tool and brush tool. It is suitable for cleaning crumbs and similar debris from sofas, upholstery, stairs etc. Crevice Tool is suitable for cleaning dirt and debris from narrow spaces, like between seats and cushions, along the edges and corners etc. Mini Soft Dusting Brush is optimized for removing dust and dirt from more sensitive surfaces. Mini Motorized Tool thoroughly cleans smaller areas from various dirt, including human and pet hair. When using Dyson cordless vacuums as handheld vacuums, Mini Motorized Tool can be used as excellent cleaning tool for cars, boats, sofas, smaller carpets and rugs etc. Stubborn Dirt Brush is used for removing hard to remove dirt off the floors and other surfaces. It has much stiffer bristles than Soft Dusting Brush, which help remove the stubborn dirt – hence the name. Hard Floor Tool is used for cleaning hard floors like tiles, laminate, and other bare floors. It is smaller and lighter than Soft Roller Cleaner Head. Also, it can be even used on low-pile carpets, but Direct Drive Cleaner Head does much better job on all carpeted surfaces. Such cleaning kit is designed to clean dust, dirt, allergens, hair, fibers and other debris from hard-to-reach places around the home using, in this case, all Dyson upright, canister and cordless vacuum cleaners. Price – Dyson V6, V7 and V8 are high-end cordless vacuum cleaners with many, very useful features and they dictate the price. If you need just a second or third vacuum cleaner at home, for a small and quick cleaning, Dyson V6, V7 and V8 are, IMHO, overkill and waste of money. If you need cordless vacuum cleaner which can be used as an emergency vacuum cleaner in the kitchen or in the kids’ room, but also can be used to vacuum entire home or apartment, from floor to ceiling, then consider Dyson V7 or V8 Absolute vacuum cleaner – when compared with V6, they are newer and improved units. Dyson V6 is still a great cordless vacuum, cheaper than V7 or V8 and it does its job well. So, if the V7 or V8 are slightly over the budget, consider Dyson V6, new or certified refurbished. These Amazon links open in the new windows. Sure, the comparison shows clearly that in general one do not need to spend more for later models when the best value is V6 Absolute with one practically disadvantage if any – allergy maybe free release of the accumulated trash. 20 min usage for V6 Absolute is long enough for an average and intelligent individual to be able to vacuum 2 Bedroom quarters, which the customer input shows. What tools and wands are useable between the different V Dyson cordless models? I’m thinking of buying a handheld for increased battery power and bigger bin but would like to continue using the V6 attachments.